An absolute delight for fried chicken lovers! 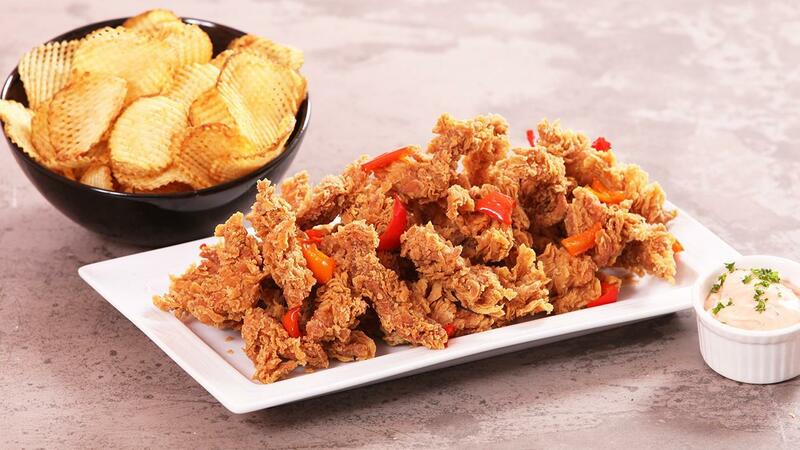 Our take on Cajun chicken strips involves a twist of Cajun Asian spice marinade and Knorr coating mix. See the full recipe below. Mix Cajun Asian Spiced Mix, water and chicken together and marinade for one hour and more in a refrigerator. Mix Knorr Coating Mix-(Coating BasePowder160g) and wheat flour together and sieved twice to a Tray to make flour mix. Coat marinate chicken in dry flour mix and fold it for few seconds. Then dip the chicken pieces in ice water for ten seconds. Again strain and coat the chicken in dry flour mix and fold for another few minutes till the flaky appearance appears on the chicken. Fry till golden brown in pre heated oil at 180 degrees. serve hot with Thousand Island Dressing.